When you own cryptocurrencies, you need to protect your confidential data and the access to your funds. With Ledger Nano S, secrets like private keys are never exposed: sensitive operations are isolated inside your hardware wallet within a state-of-the-art Secure Element, locked by a PIN code. Transactions can’t get tampered with; they are physically verified on the embedded screen with a simple press of a button. In order to be able to send cryptocurrencies using your Ledger Nano S, you must first initialize your device. Once initialized you will need to download the Ledger Manager application, along with the Ledger Bitcoin Wallet. When you want to receive coins, you just have to provide your address to the payer. Your Ledger Nano S does not need to be connected as the transaction is made on the blockchain, not on the device itself. Next time you connect your wallet, it will synchronize to the blockchain to display all of your past operations and your balance. To send Bitcoin using your Ledger Nano S, you need to follow these steps. You need to connect your Ledger Nano S to your computer. You will be asked to enter your PIN. Launch your Ledger Bitcoin Wallet Chrome application on your computer. The Ledger Wallet Bitcoin application is the same interface to manage both your BTC and your BCH (and also some other altcoins). You must select on which chain you want to operate. 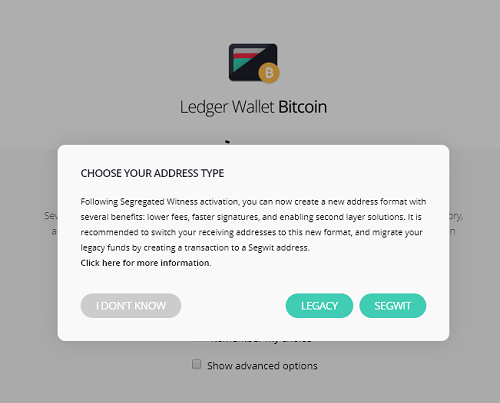 When starting your Ledger Bitcoin app, you may be asked to choose between Legacy and Segwit address type. Choose whichever type of address you use to store your Bitcoin. On the following screen, click on “Send”, and a popup window will open. 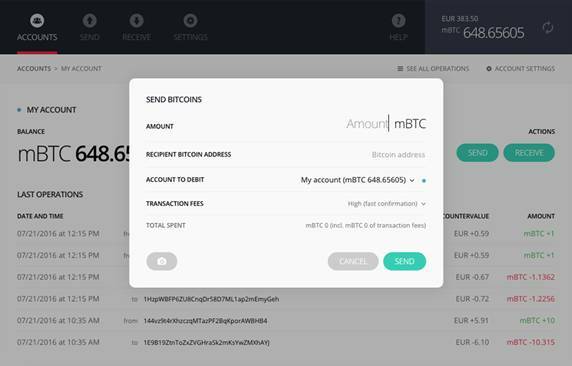 Fill in the required fields (enter the BTC amount, paste the recipient address, select the level of fees, click on the “Send” button). It is important to note that the fees are not charged by Ledger Company but by Bitcoin miners. In the Ledger Bitcoin Chrome application you can select between 3 levels of fees. These fees are dynamically estimated depending on the amount and the number of outputs needed to send this amount. Fees amounts are dynamically calculated, depending on each specific transaction. When you fill in the amount, the popup automatically calculates the fees and the total spent, and you can estimate the 3 types of fees by clicking on each level in the scroll menu. Your transaction is validated and will be tracked on the Blockchain as soon as it is confirmed by miners in accordance with Bitcoin protocol. While waiting for this confirmation, your Ledger device can be disconnected as your transactions are tracked on the Blockchain. These transactions will be synchronized on your wallet when you open it. – You did not use the right application on your Ledger Nano S.
– Synchronization failed. Reset the Chrome application by clicking on Settings > Tools > Reset application data and try again. – Servers or the blockchain network are temporarily overloaded. Try again later. – The (amount + fees) exceed your total balance. – There is an unconfirmed transaction in your wallet. You need to wait until this transaction is confirmed or rejected. – You did not confirm the transaction. When you try to make a transaction, the Nano S displays the message “Confirm transaction” with a cross on the left and a check icon (✓) on the right. After verifying that the receiving address is correct, you can press on the check icon button. Next articleIs EOS Really Worth The Better-Than-Ethereum Hype?